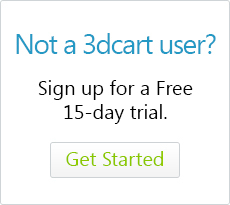 Our designers can help migrate your existing look and feel onto the 3dcart platform. You will want to start this process early because it usually will take 5-7 business days from beginning to end. create a new store design. Once you speak to our project manager and get this process started, you can move on to step 2. You don't have to wait until the design is done to move on. If you are migrating from another shopping cart solution, ask your existing provider for a product export. Most shopping cart providers are able to export data in comma delimited or tab delimited formats. With some minor editing of the export file's column headers, you can format your existing provider's export file into a 3dcart compatible CSV file. If you are not migrating from another shopping cart, you can use the product import template to import your product data. You can download a sample of the CSV file here. Feel free to contact our support team if you have further questions about this file. There are two types of pages you can create; Menu Links, and Extra pages. You can use ether of the sections to create content pages. More information on the Site Content area can be found here. Using the temporary store URL place as many orders as you feel necessary to make sure all the configurd settings are working to your liking. For example, make sure the shipping rules display the correct rates and that the payment options you specified are working as expected. Instructions on the basic store testing process can be found here. Setup your email accounts and email forwarding accounts by using this guide. Once your satisfied with the store, you can make the DNS change to your domain. Instructions on this process can be found here. The DNS change will typically take between 2-48 hours, once the store URL has been migrated, be sure to run some more tests, just to make sure everything is still working as expected with the new domain.